CMHC did a survey to find out why real estate in Toronto and Vancouver is so hot. More than half of properties saw bidding wars. Have you ever woke up after a night of drinking, and only had a vague recollection of what happened? Then your responsible friend sets off a chain of text messages, trying to figure out where you went wrong? Well that's what the Canadian real estate industry just did, and man-o-man did people screw up. The Canada Mortgage and Housing Corporation (CMHC), the Crown corporation in charge of mortgage liquidity, conducted a massive survey of recent buyers in Toronto, Vancouver, and Montreal. After getting drunk on exuberance, buyers indulged in a little too much borrowing, blaming everything from land scarcity to foreign buyers for the street fights bidding wars they entered. The CMHC designed a massive survey to try and figure out where buyer exuberance started. Buyers in Toronto and Vancouver saw a quick rise in home prices, and adopted "excessive" expectations of price growth. To determine where the disconnect between fundamentals and price growth started, they took a novel approach - they asked the buyers. 30,000 recent buyers were sent surveys, asking questions ranging from what their budgets were, to why they didn't stick to their budget. 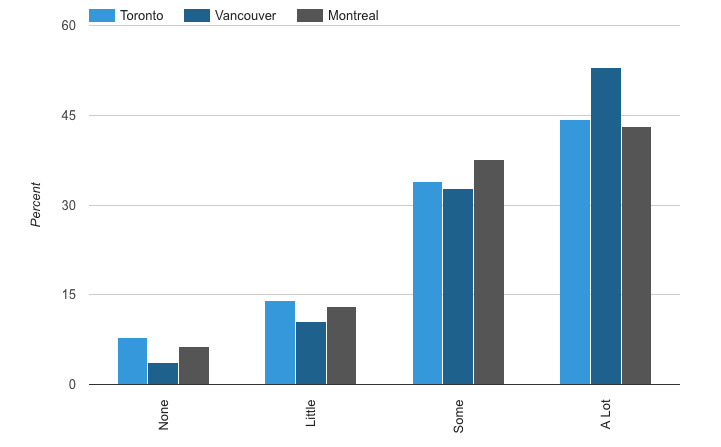 The majority of price movements were driven by exuberance in Toronto and Vancouver. Yes, fundamentals played a part - but a small part. Instead, the survey focuses on finding out which data points buyers felt drove their FOMO. The fear of being "locked out" is always a powerful motivator, which tends to amplify the read on fundamentals. Now, issues like foreign buyers are important, and need to be tracked and dealt with. However, no one forced anyone to buy in the small window of exuberance. The homeowner life didn't choose these buyers, buyers chose the homeowner life. Despite what you may have heard, not all renters are poor and struggling to eat. Actually, a surprising number of bank executives are now renters, but I digress. Let's find out what these people were thinking. First up, the CMHC found that buyers use "rule of thumb mechanisms" to determine home prices. "It's a hot market," "I can't miss out," and "it's really tight right now" are phrases analysts cited as examples of this mechanism. According to the CMHC, these were "phrases pushing homebuyers to overvalue an investment." FOMO helps to build an overreaction to data, which resulted in a lack of self-control. The best example of this is a buyer's willingness to engage in a bidding war. The majority of buyers entered a bidding war in Toronto and Vancouver. 55% of survey respondents in both cities said they entered a bidding war to buy their current home. To contrast, just 17% of Montreal's buyers experienced a bidding war. Buyers that accelerated their buy, tended to break their budget according to the CMHC. Vancouver saw 47.91% of buyers pay more than they had planned. Toronto saw similar levels, with 47.79% of buyers paying more than budgeted. 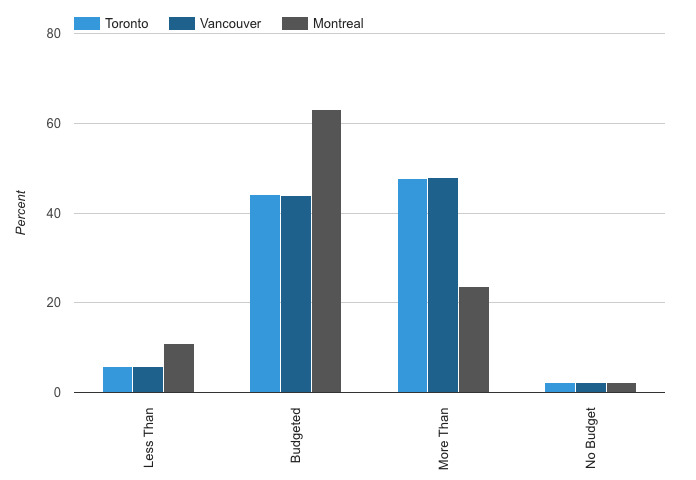 To contrast, Montreal only saw 23.67% of buyers pay more than they budgeted. FOMO was the primary driver of breaching, with most of these homeowners buying sooner or later than expected. CMHC analysts believe that those that bought sooner likely lacked market information, pushing budgets higher. Those that bought later couldn't find what they wanted in their budget, driving them to an upward budget revision. CMHC survey of recent buyer budgets, and whether they stuck to them. If Canadian real estate markets had a phrase of the year, "foreign buyer" would have been it in 2017. In Vancouver, 67.8% of buyers said foreign buyers had "a lot of influence" on home prices. Toronto was a little further behind, but not much at 47.88%. To contrast, 42.31% of Montreal buyers felt foreign buyers had a strong influence. Foreign buying is actually a part of the development strategy in cities like Vancouver, but they always tend to show up in droves when local credit expands - just like in the late 1980s. Funny how that works. CMHC survey responses from recent buyers, on the perceived impact of foreign buyers on real estate prices. Who Needs A Job When You've Got Credit? Employment growth is normally an important fundamental factor, but buyers didn't agree. In Vancouver, only 17.03% of buyers felt it had a lot of influence. Toronto buyers felt it was a little more important, with 26.24% of people thinking it had a lot of influence. To contrast, 35.05% of Montreal buyers felt it had a lot of influence on home prices. The bulk of respondents in all cities felt it had some influence on prices. CMHC survey responses from recent buyers, on the perceived impact of employment growth on real estate prices. None of these locations are growing like they used to, but population growth was still a perceived factor. Toronto had 54.56% of respondents claim population growth had a lot of influence on prices. Vancouver came in just under that, with 51.39% of buyers feeling the same way. Montreal only had 38.94% of buyers that felt population growth had a lot of influence on prices. 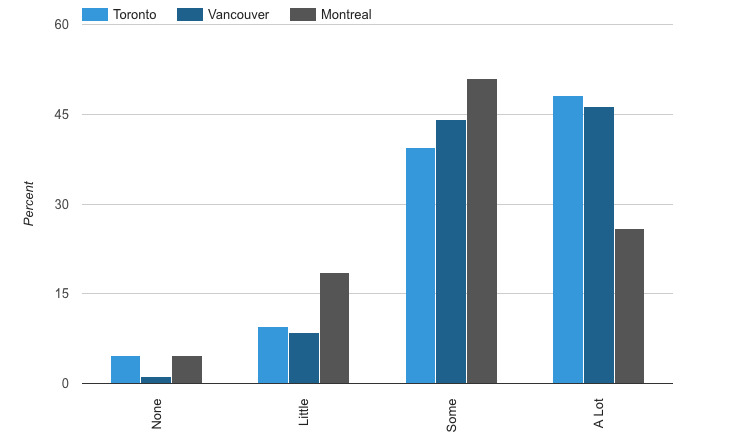 For context, Montreal has the fastest growing population of the three regions. CMHC survey responses from recent buyers, on the perceived impact of population growth on real estate prices. We're Running Out Of Land! My favorite narrative, we're running out of land - a.k.a. land scarcity. Vancouver had the most buyers that felt land scarcity had a lot of influence, with 52.94% of buyers agreeing. In Toronto that dropped to 44.22% of buyers. Montreal was just under that, with 43.06% of buyers agreeing it had a lot of influence. CMHC survey responses from recent buyers, on the perceived impact of land scarcity on real estate prices. Locals seem to underestimate the impact of domestic investors in all three regions. Toronto had the highest ratio of people that felt they had a strong influence, at 48.11% of buyers. In Vancouver, that number dropped to 46.33% of people feeling they had a lot of influence. 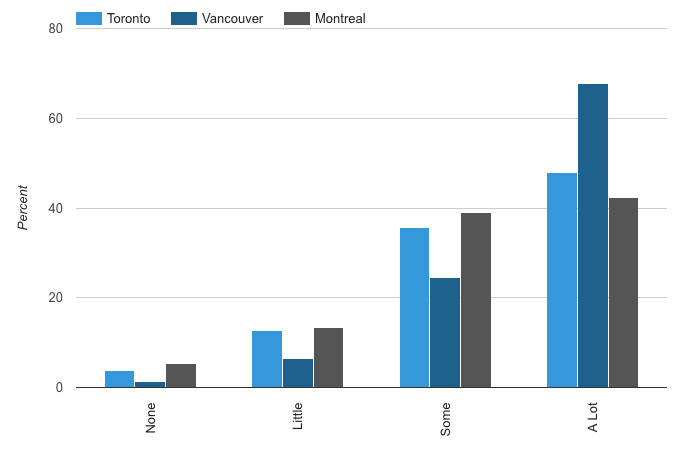 Montreal only had 25.9% of buyers that felt domestic investors were a contributor to prices. I'm guessing not a lot of people in Toronto know the city's domestic investor numbers, or that agents in Vancouver are sometimes paid with condos. Ah well, another article for another day. CMHC survey responses from recent buyers, on the perceived impact of domestic investors on real estate prices. These factors did contribute to higher prices, but buyers added emotional premiums. During the peak of a real estate cycle, buyers will always become exuberant as prices accelerate. Speculators, both international and domestic, can usually smell the blood and begin circling. Did people line up, and are foreign buyers accumulating massive portfolios of homes? Or were people paid to stand in linefor condo assignments, with employees posing as Mainland Chinese buyers? Probably a little of both. However, it often doesn't matter if the narrative is true or not, it just matters if you're willing to max out your credit. As my favorite real estate agent once posted on her Instagram, "anything is possible if you belief [sic] it is."